The book Embracing the Wild in Your Dog, by Bryan Bailey, discusses how dogs relate more to wolves than to our anthropomorphic notions of dogs. It explains and gives examples of how dogs behave in, react to, and experience the world through the eyes of their wolf ancestors. The book presents many common-sense scenarios on the behaviors that many dogs perform which owners struggle with today. The author ties in how these same types of behaviors can be explained away by looking at wolves, and how they actually play a vital role in wolves’ survival in the wild. The author presents plenty of evidence to support his case that dogs behave like wolves despite many decades of selective breeding. Written in first-person narrative the book is informative and well written. Grammar and editing is correct with few errors, if any. The author presents his information clearly and professionally, but does sometimes become repetitive about a specific subject and starts to ramble, making his chapters slightly long. He makes up for it, though, by keeping the reader intrigued with small stories of his personal experiences. His writing, while coherent, does not follow a linear progression, and sometimes the timeline is hard to follow if the reader is not paying close attention. The author enthralls his readers by relaying many stories of his experiences along the way, giving a more personal insight of his individual involvement with his clients. This also helps the readers relate to specific situations in the book and causes the reader to become invested emotionally. Selected quotes from other sources headline each chapter and give a poetic introduction to the subject matter about to be discussed. Overall the book is captivating, well written, and very informative. It allows people to come to a better understanding of dog behavior, dogs’ wolf ancestry, and why they continue to display many of the same survival mannerisms today. It also points out how our mistaken perception of our pets as small, furry human beings is completely incorrect. Q. Why do you think it is so important for potential dog owners to understand dog behaviors relating to wolves? A. All dog behaviors find their roots in wolf behaviors. Selective pressures created by thousands of years of domestication have caused some behaviors in dogs not to activate as readily as they would have with a wolf, but nevertheless, the behaviors are still there. Therefore, if you ever strive to modify your dog’s behavior to conform to your human existence, you will need to understand and address the natural mechanisms given to the wolf by nature to enable it to survive in a non-human existence. This is necessary because the wolf passed these same mechanisms to our dogs who continue to use them even though they live with humans. Dog owners who are not aware of these natural mechanisms will approach their dog’s training from a humanistic standpoint and try to train it like they would a human. Unfortunately, successful methodologies used in modifying human behavior fail to modify wolf and dog behavior. Q. How do you feel your background experience has helped you to see and understand that dogs behaved as wolves and how does that knowledge tie in with how you interact with teaching dog owners? A. My ability to observe wolves in the wild, that had yet to become fearful of humans, coupled with the many insights passed to me by my mentor regarding their behavior, was truly a blessing and became the cornerstone of my future studies and teachings. For over thirty years, my clients have benefited from my knowledge because I have taught them how to view the world through the eyes of a domestic wolf and not a little person in a fur coat. By doing so, they were able to adjust their dog’s behavior in a way that their dog easily and readily understood, resulting in a more reliable response to their commands and with more spirit. Q. In your book you tend to portray owning dogs as a much more difficult task and some would say that after reading this book, owning a dog breed with the potential of behavior issues would be the last thing they’d want to contend with. What would you say to this? A. Owning a dog is not difficult at all. Owning a well-behaved dog that conforms peacefully, cooperatively, and safely with you and your family is what is difficult if you are today’s average American dog owner. I explain why I believe this in the chapter titled, “Will.” As for the second part of the question, contending with dog breeds with the potential of deadly aggression should be more of a concern than contending with those that have the potential of behavior issues in general. For example, all dogs have the potential to bite, as five million Americans per year can attest to, but it’s worth noting that some breeds, like Pit Bulls and Rottweilers, have actually caused hundreds of fatalities in the U.S. Therefore, if you are an inexperienced dog owner, or you have young children, you may wish to contend with a dog breed that has proven to have a lesser potential to harm you or your children. Q. In the book you state that this book is not a dog obedience book, but rather a book about developing a deeper understanding of what drives your dogs behaviors. How valuable do you feel this information is when wanting to begin obedience training for your dog? A. Before one embarks on repairing or modifying a watch, is it not important that one knows first how the watch works? If you wish to successfully train your dog not to jump on you or your guests, would it not be beneficial to understand why your dog wishes to jump on you in the first place? If you wish to train your dog to fetch a ball, would it not be beneficial to you and your dog (so you don’t get mad when he/she doesn’t fetch) to understand why your dog does not naturally fetch? Why your dog NATURALLY does every behavior it does is the first step in adjusting those very behaviors. Q. This book doesn’t go over obsessive behaviors like barking, chewing, or digging. Is this something you are thinking of addressing in the future, possibly in another book? A. Indeed. I am currently writing my second book titled, The Hammer – Understanding, Treating and Preventing Canine Aggression, which will be published mid-summer 2016. 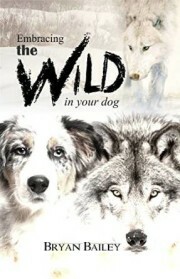 Afterward, I will write my third book titled, Taming the Wild in Your Dog. Whereas my first book creates an understanding of dog behavior, this book will teach readers how to use their new found understanding to train their dogs. Q. What overall message concerning dogs do you most wish readers to take away from this book? Excerpt From: “Embracing the Wild in Your Dog.” Understand and accept the dog for what it is and not what you wish it to be. Embrace this gift from nature. Learn more about our Sponsored Book Review Program.